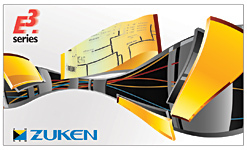 July 6th, 2011 – Munich, Germany and Westford, MA, USA – Zuken today announced the latest version of its powerful electrical CAD software E³.series. This version focuses on delivering benefits to all electrical design engineers creating electrical systems for everything from aircraft, vehicles, machinery, control systems, printers, etc. The time saving shortcuts and additional new functionality in this release impacts every aspect of electrical design from the large task of planning the topology and functionality of a design, down to the smallest of tasks such as adding connectors and handling signals. "As one of the first larger E³.series customers we are happy to see that Zuken has again listened to the wishes of our engineers when developing the new release of E³.series 2011. In this sense we feel well even among the other 2000 plus customers. Based on the results of our Beta Testing we are keen to switch to E³.series 2011 even before our summer breaks," commented Wolfgang Ruf, Project Engineering Manager from Liebherr. 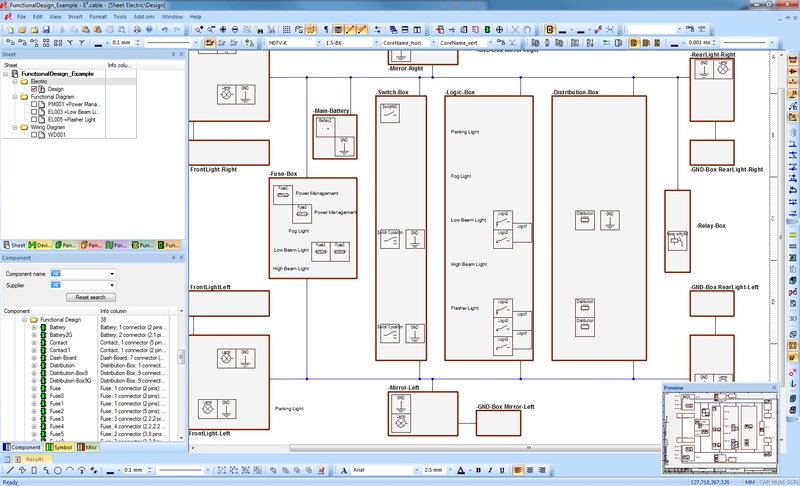 Since the introduction of Zuken’s functional planning tool, E³.Functional Design, in 2010, the team has developed this further to make the up-front sketch–pad type planning phase even quicker and easier. The functional blocks are now dynamic, enabling a user to create blocks on-the-fly that can be updated with a complete library part later in the design process. Rather than needing a library item to be defined, the designer can simply sketch out the design and come back to the details later. There are also numerous enhancements to the display, search and highlight functions that enable designers to recognise changes and similarities when making movements and placements within the functional design. 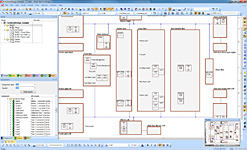 Variant management capabilities have been advanced within E³.panel, the physical panel design module of E³.series, enabling the creation of completely different variant panel layouts within the same design. This allows the designer to optimize the panel layout in each variant, if desired, by using an entirely different size backplate, rails, and component placement for each. There are no unnecessary spaces in designs for components that might be present in another variant, and wire routing can be entirely different to optimize wire length and production costs. Zuken has made additional enhancements in detailed areas for everyday users that have been exceptionally well received. Connector handling has been improved to simplify the design process with functions such as supporting bulkhead connectors, connectors with pins within pins, and connectors with several plug sides. This includes the flexibility to attribute a different signal name to a connector part on each side of the connecting point, improved automatic selection of mating connectors, plus checks to verify you have used valid plug connectors. Always keeping E³.series up-to-date, the user interface is fully Windows® 7 compliant and runs natively on both 32-bit and 64-bit operating systems. Signals can now be classified into groups that enable users to de-clutter their drawings. This classification system allows users to connect signals with different names (such as different ground signals) to a common point in the design. E³.series is Zuken’s Windows-based modular, scalable and intuitive system for the engineering, design, documentation, and manufacturing of wiring, harnesses, cable assemblies, control panels, hydraulic and pneumatic systems.. E³.series’ core object-orientated architecture supports the entire engineering flow from concept to manufacturing and eliminates the need for data transfer between different modules. This reduces errors, increases quality and allows engineering changes to be completed much more effectively. E³.series can also be smoothly integrated with existing applications and processes through standard and customizable, bidirectional programmable interfaces. Zuken is focused on being a long-term innovation and growth partner. The security of choosing Zuken is further reinforced by the company’s people—the foundation of Zuken’s success. Coming from a wide range of industry sectors, specializing in many different disciplines and advanced technologies, Zuken’s people relate to and understand each company’s unique requirements. For more information about the company and its products, visit www.zuken.com.